"More investors are viewing ETFs as the foundational component of a well-diversified investment portfolio, and we think that sentiment will continue to grow." 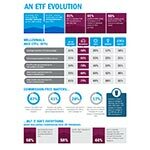 SAN FRANCISCO--(BUSINESS WIRE)--ETFs are becoming an increasingly important part of investors’ portfolios, according to a new study by Schwab. On average, investors already using ETFs are now allocating one-fifth (21 percent) of their total portfolios to ETFs, up five percentage points from 16 percent in 2012. Moreover, these investors expect that number to jump to 25 percent in the next five years, and one-third (34 percent) say ETFs will form the core of their investment portfolios in the future. In its fifth installment, The 2015 ETF Investor Study by Schwab is an online survey of more than 1,000 individual investors between the ages of 25-75 with at least $25,000 in investable assets who have purchased ETFs in the past two years. Sixty-one percent of ETF investors would consider using stock-based ETFs instead of individual stocks in their portfolio, and 55 percent say they would consider using fixed income ETFs instead of individual bonds. When it comes to the types of ETFs that investors want to hold, 64 percent of ETF owners say that they are interested in both core and specialized ETFs, up from 56 percent who said the same thing in the 2013 survey. More than half (59 percent) of ETF investors currently have investments in an all-ETF portfolio, which was defined as a dedicated account or investment portfolio comprised solely of ETFs. For that group, all-ETF portfolios represent an average of 16.5 percent of their total investments. One-third (32 percent) say they are interested in an all-ETF portfolio that an advisor creates and manages for them while 41 percent of ETF investors say they’d like to be able to build an all-ETF portfolio online themselves. One-third (32 percent) of ETF investors say they would consider using an automated investment service, often referred to as “robo-advisors,” to create and manage portfolios of ETFs for a portion of their assets. The majority of investors are taking a “wait and see” approach to active ETFs – a third of investors (33 percent) are unsure about active ETFs and 36 percent say they wouldn’t consider adding the strategies to their portfolios at this time. However, one-third (31 percent) say they would consider using actively managed ETFs. Among the enthusiasts, 35 percent simply prefer active management to passive investing, 28 percent believe actively managed ETFs can add value in certain market environments or asset classes and another 30 percent believe these ETFs could be a good complement to passive ETF strategies. On the other hand, 48 percent of those who are not interested in active ETFs say the appeal of ETFs lies in the passive, low-cost nature of the strategies and 35 percent say they don’t believe the products are worth the additional cost. A resounding 41 percent of ETF investors believe that commission-free ETF offerings are game-changing for investors. And, when evaluating the overall cost of an ETF, 87 percent believe that trade commissions are important. In fact, 28 percent only invest in commission-free ETFs at their brokerage firm and 17 percent say they would move their account to a different brokerage firm to gain access to commission-free ETFs. However, access to commission-free ETFs alone isn’t enough for ETF investors – they also demand transparency and access to a selection of commission-free ETFs that they believe is right for them. When evaluating commission-free ETF offerings, two-thirds of ETF investors (66 percent) say it is extremely important to them to have transparent pricing with no hidden fees, 58 percent say it is critical to have access to the “right” selection of ETFs and 46 percent say it is extremely important that their brokerage firm offers ETFs that span the broadest number of different asset categories. The 2015 ETF Investor Study by Schwab uncovered notable differences in attitudes towards ETFs among different generations. The prominence of ETFs within an overall investment strategy is particularly pronounced among younger ETF investors. Millennials (aged 25-35) say that ETFs currently make up an average of 41 percent of their portfolios, compared to a 21 percent share among all investors. Sixty-one percent of Millennials plan to increase their investments in ETFs in the next year. And, Millennials think the future of ETFs is bright. Seventy percent of Millennials see ETFs as the core investment type in their portfolio in the future. Significantly, 77 percent say they would consider using stock-based ETFs instead of individual stocks in their portfolios and 69 percent would consider using fixed income ETFs instead of individual bonds. The 2015 ETF Investor Study by Schwab is the fifth installment of an annual online survey of more than 1,000 individual investors between the ages of 25-75 with at least $25,000 in investable assets who have purchased ETFs in the past two years. Conducted by Koski Research from July 29 – August 10, 2015, the study has approximately a three percent margin of error. Survey respondents were not asked to indicate whether they had accounts with Schwab. All data is self-reported by study participants and is not verified or validated. A leader in the retail ETF market, Schwab had $242 billion in ETF assets custodied on its platform as of August 31, 2015. Through its operating subsidiaries, The Charles Schwab Corporation (NYSE:SCHW) provides a full range of securities brokerage, banking, money management and financial advisory services to individual investors and independent investment advisors. Its broker-dealer subsidiary, Charles Schwab & Co., Inc. (‘Schwab’) (member SIPC, www.sipc.org), and affiliates offer a complete range of investment services and products including an extensive selection of mutual funds; financial planning and investment advice; retirement plan and equity compensation plan services; compliance and trade monitoring solutions; referrals to independent fee-based investment advisors; and custodial, operational and trading support for independent, fee-based investment advisors through Schwab Advisor Services. Its banking subsidiary, Charles Schwab Bank (member FDIC and an Equal Housing Lender), provides banking and lending services and products. More information is available at www.schwab.com and www.aboutschwab.com.